Snakes | ARISE! LET US BE GOING! This fellow appeared last night. I’m thinking there is a brood of vipers under the rectory. Despite the seemingly diamond shaped head, this just hatched serpent is surely NOT a baby Copperhead. It’s certainly NOT a baby Rattler, not even an Eastern of that ilk. I’m no herpetologist, but I’m guessing that the wide scale-plates on top of the head indicate that this kind of snake stays tiny. You would otherwise see a gazillion little scales. Maybe. But it could get big, so that it’s perhaps a baby Eastern Black Racer, or Rat Snake, which anywhere else might be called a Bull Snake. They can get six feet long. Harmless. Beneficial. If you don’t have chickens! He was let go in the Asparagus Patch. He can guard the spears from poachers, perhaps even underground moles who love to eat Asparagus roots. Laudie-dog wasn’t invited to get a look-see, as she would instantly tear the poor creature to pieces. If one knows this, one can avoid it. Shadow-dog was invited to get up close, nose to nose, and wasn’t nervous at all. Just inquisitive, and looking to me to know what to think of such a beast. I just let the snake go and so he absolutely didn’t care one way or the other. Gooooood daaaawgy! We’re to be as clever as snakes even if as innocent as doves. One cannot actually be clever without being innocent. Being innocent develops cleverness right quickly. Moses lifted up an image of the kind of snake that was killing the people in the desert so that all of those who looked upon it might live. Jesus said that He is that snake on the cross. He looks like us, we who kill each other off in sin, but He, standing in our place, the Innocent for the guilty, providing us life, having the right in His own justice to have mercy on us. We are to beware, however, of the ancient Serpent, Satan, and we are to be aware of what Satan can do to certain willing parties, taking them over even though Satan makes them look good. Do you remember this scene of the false prophet, the anti-Christ, directed by the ancient Serpent, Satan? There is a couple of miles high up in the mountains in which it is as likely as not to see a Timber Rattler, alive or dead, on the curvy simple road that is made of loose gravel sprayed with oil. Locals have a penchant for running over snakes and turtles and anything else they can steer into perhaps without wrecking their vehicles in order to do so. As often as not, if it is a snake, especially a rattler, they’ll cut the head off, and the rattle, for souvenirs. Jesus has His own souvenirs after His own encounter with the snake mentioned in Genesis 3:15. Jesus’ souvenirs are in the form of five wounds in hands and feet and in His side, His Heart. But Jesus otherwise doesn’t parade around a snake head or tail. The other night, coming back from the day-off, very near the hermitage, I once again encountered a magnificent Timber Rattler. Screech! Sassy the Subaru’s brakes work most excellently. Out on to the road I popped with telephone camera in hand. I kept about eight feet away as he was ready to spring into action. I took a couple of pictures, and then a car came. I put Sassy into gear and carefully, deliberately, exaggeratedly drove around our snake friend, hoping the crowd in the car behind me would take note of the nice snake and drive around this wonder of nature. Instead, they very slowly and deliberately drove over him, thinking they had accomplished something. And this is exactly why some exorcisms fail: because of pride, because of attacking Satan directly under one’s own (lack of) wherewithal, in one’s own name, not in the Holy Name of Jesus, but still thinking one has accomplished something. This is a mind-game with Satan on his own terms, on his own turf. He will be happy to make one think that he has been thrown out, only to come back in a more insidious way. Jesus Himself speaks of this kind of stupidity. This is a seven-fold failure, a perfect fail. Again, the exorcist who works under his own authority may seem to have great success baiting him into thinking that he is right to buck the authority Jesus Himself gave to His own Church. The disobedient exorcist may think he is himself most charitable, a martyr of charity. No. Satan will come back in more insidious ways, destroying peoples’ lives all the more effectively. The upshot in our own lives: We are not to attack Satan directly. We are not to attack sin directly. Yes, we are to make a firm purpose of amendment, avoid occasions of sin, get out of an occasion of sin should we find ourselves in such, all the normal, traditional things. Yep. BUT! But we are NOT to make it all about us, about how powerful and great we are, because we not that. Instead, we are to call on Saint Michael, on our guardian angels, and do this with humility. We are to be humbly thankful to Jesus for coming into this fallen world to grab us and bring us to heaven, because, wow, it’s so obvious we need saving and it’s He that is our Savior, NOT us. The person who says: “I’m doing well now!” is the person who will fall almost immediately. We cast out Satan and sin by Jesus drawing us into friendship with Himself, by being in humble reverence, thankful, in friendship, before Jesus, confident of His love for us, of His immediate care for us. Jesus said that we cannot, will not enter the kingdom of heaven if we are not like little children before our heavenly Father. Little kids don’t count on themselves to be saved. They look with confidence to others, and in the cases above, to Jesus. Jesus saves us from Satan. Jesus leads us into a true life of prayer, to walk in His presence, even in the most trying of circumstances. Thank you Jesus. Meanwhile, getting back to the rectory late at night, another suspicious pattern, but actually just a baby black snake faking being a Timber Rattler. This is just a section of the body. He’s been ripped apart before I got back from the “day-off.” Poor thing. Out of focus or not, that’s good enough for me. All very poopy. Not to worry. I looked it up. Dogs eating venomous snakes for breakfast doesn’t hurt them in the least. :-) Shadow-dog was simply content with a good snack. It’s been raining and raining and raining after snowing and snowing and snowing. The back yard is a bit of a mess. I’m planning on extending the fence and planting lots of grass seed. Meanwhile, don’t feel sorry for wet and muddy Shadow-dog. He has a warm dry shelter out of the weather tucked far back under the non-mud-cement-patio corrugated roof. Also, he comes in for most of the night. You just have to know that a GSD loves water and mud. He’s been expanding his mud holes with water in them just for fun. I don’t mind. I did that as a kid. Why not? One proud and brave Shadow-dog. One now impressed but scared snake-handler. Just when people think they “have you”, you come out stronger for it, more character, a broader foundation of experience from which to proceed, with Jesus, of course. Hah. Just when the devil thinks he “has you”, you come out stronger for it, more character, a broader foundation of experience from which to proceed, with Jesus, of course. Hah. Just when your fallen human nature thinks it has won, you come out stronger for it, more character, a broader foundation of experience from which to proceed, with Jesus, of course. Hah. How shameful! Father George is in a short-sleeved clergy tactical work shirt with the collar open doing a bit of R and R! And he’s, he’s, he’s a man of ecumenism, practicing up to be a Western North Carolina Baptist Minister Snake Handler! Surely he’s a snake in the grass! Whatever you want to call him (Eastern Racer, Bull Snake, Rat Snake, Black Snake, Snake in the Grass, Satan…), this is the friendliest kind of serpent in the world. Oh, I’m talking about the snake, not me! Or do I protest too much? Anyway, these guys are happy to laze around in the sun right in front of you, keeping a watchful eye for varmints. It was a local one-time Baptist minister friend who was happy to see me practicing up. He’s the one who brought the snake over to a parishioner’s house as there was a developing problem of rats eating the dog food, a serious concern since she raises the best cadaver, drug, bomb, protection, accompaniment, PTSD, and especially bite-dogs in North America. Everyone was scared of the snake, only because they think such snakes bite. They don’t. But her bite-dogs do bite. One of them broke her training “arm” with one bite. She said she saw one bite-dog break both forearm bones and rip off the forearm of someone in one bite. Serious dogs. I’m making friends with the one that law enforcement is especially afraid of. So far, he sits down for me upon request, but at this point that only means that he’s happy to make a meal of me while sitting down. Yikes! In these days of great confusion in both the Church and the world, I think we need to remember a sense of humor amidst all the darkness, and be able to bring joy to those around us. We are all Missionaries of Mercy when we do this, as this brings people hope. Archbishop Fulton Sheen once said that making people who suffer laugh was a great act of mercy. When we suffer we tend to drag all the hurt of the past into the present, and then project all that into the future dragging that, then, back into the present as well, making for unbearable suffering. But when, in the present moment, one is brought into innocent laughter, all of this mind-game with time of past and future is shattered, giving one hope for the future regardless of the past because of present goodness. Our greatest fears are brought under control with the love that Jesus Himself provides to us, His littlest children. This is a common brown snake, otherwise known as a city snake, a garden snail eater of all things, which I picked up in the back yard of the rectory. Sigh. This is the dreaded serpent because, well, it’s definitive then. I’m no longer a mountain hermit. I’m domesticated, a city slicker. Sigh. 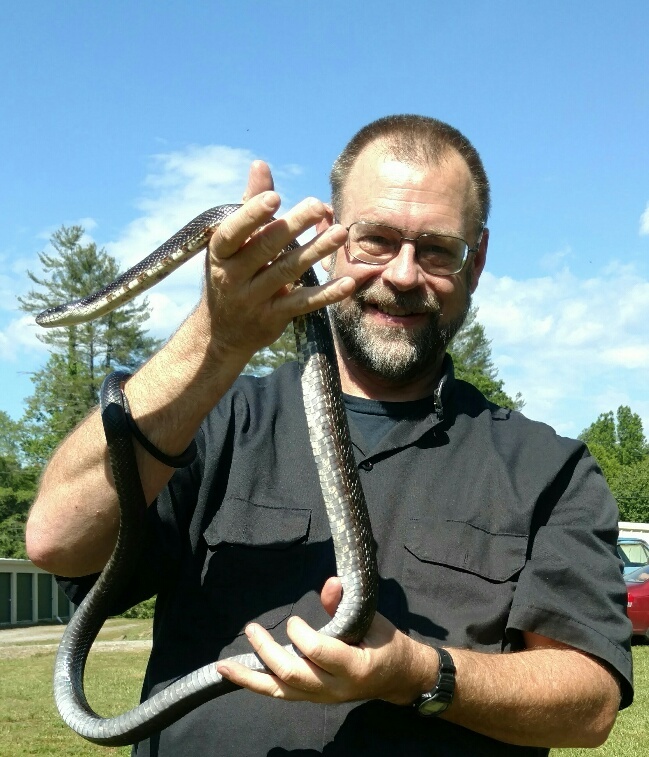 Oh, for the days in the hermitage with timber rattlers and water moccasins and copper heads and whatnot, where even the rat snakes and Eastern Racers got six feet long and over. But here in the city the snakes are all measured in inches. Sigh. And what’s worse, I’m even busy with Spring cleaning. Sigh. I’m so domesticated. It all just makes me long for the days of my youth with extreme sports knuckleheadism. But, O.K. I’m domesticated. So be it. Heaven will be different! O.K., maybe I should make something of this, like an encouragement, gentle as it is, to get to my popular version of the thesis on Genesis 3:15, you know, about the crushing of the serpent on the head, something like that.